For our first anniversary in 2007, the hub and I took the Amtrak from San Diego to Santa Barbara, about a 5-6 hours train ride. We supported the "Santa Barbara Car-Free" campaign, and received great discounts at our bed & breakfast, Casa Del Mar, and on our train tickets. It was worth it, and without a car, we walked around a lot so that was a big check off our list for 'exercise'. After we got settled in our cute little cottage/bungalow, we headed off for din-din! 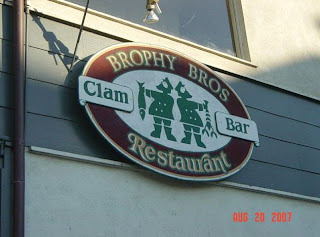 Brophy Bro's was shown on Rachael's Vacation on the Food Network, but I didn't see that episode until recently. 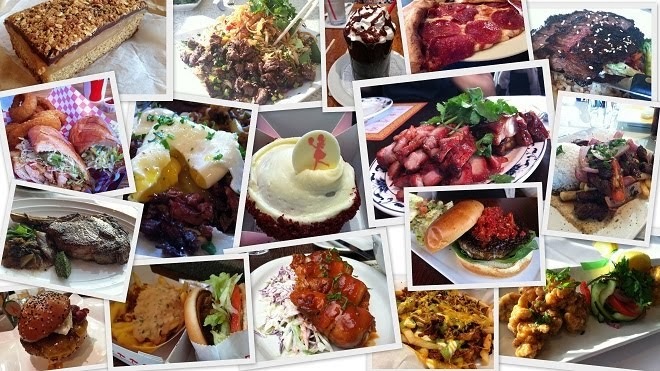 Our friend, Kira, recommended it to us, and we sure glad we went! Brophy's is not located on Stearn's Wharf. We made that mistake by walking way over there, when it's actually super close to our B&B. The wait time was about one hour because we requested outside seating, but it was worth the wait. We sat patiently on the harbor, people watched, and relaxed outside of the restaurant. We even watched fishermen unloading a huge ol' load of sea urchins. Somebody near us said, "Oh, look, they caught lobster." Wha?? 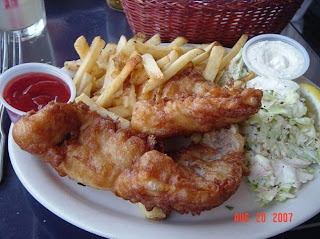 Oh yes, I absolutely love fish n' chips. These, I have to say, were ranked pretty high in my book for the crispiness of the beer batter, the flakiness of the cod, and the crunch of the cole slaw. Yum... I was in heaven! It seriously was perfecto. One of the best, Jerry - the best! 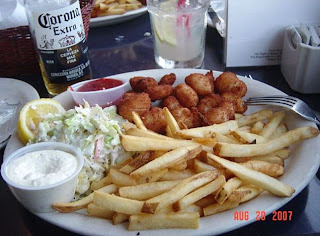 The hub got the fried scallops plate. He loved it. 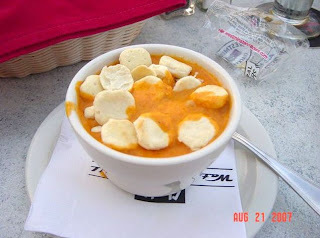 Oh, I forgot to mention that we both started off with a cup of the creamy clam chowder. 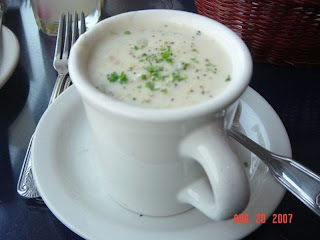 A cup of chowder from a seafood restaurant is an absolute must! The service was great. The restaurant is really small, but quaint, and very crowded. Definitely has that "dive" feel and it seemed like a lot of locals frequent the place after work for a beer. The community college is right across the street also, so there were some college kids hanging out as well. Gosh, aren't you craving fried goodness right now? I am! 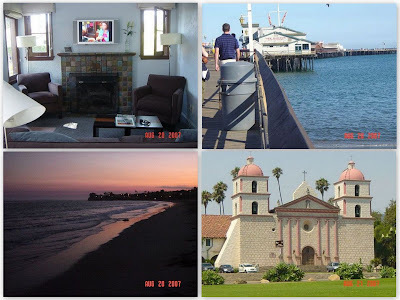 Because we were "car free", I found walking tours online - our big hike was to the Santa Barbara Mission. 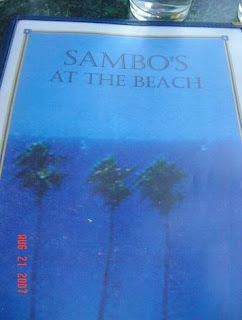 Before we headed off, we heard about a place called Sambo's for breakfast. Sambo's, originally opened in 1957, is located just right around the corner from our bed & breakfast on West Cabrillo Boulevard, the street that runs parallel to the ocean. We opted for a table outside to people watch, and to be near the ocean. Ahhh, sounds relaxing huh? It was! 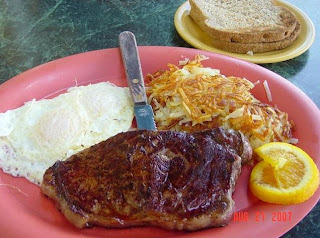 I love a good ol' plate of NY steak (medium) & eggs (over medium), extra crispy hashbrowns, and white toast to dip into the runny egg yolk - delicious! 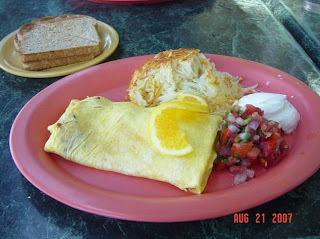 Mike loves omelets - he ordered the Santa Barbara omelet which had avocado, bacon, cheese, and a side of pico de gallo & sour cream. Both of our meals were delicious, pretty straight forward, and a good hearty way to start the day. After walking more than eight miles through downtown Santa Barbara (State Street), Alameda Park to visit the turtles, and up hill to the Santa Barbara Mission, and BACK... it was definitely time for lunch. 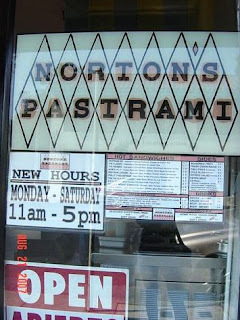 One of the local magazines at our B&B had a listing for Norton's Pastrami. What, our favorite cured meat?? This place was calling our name, for sure! Located in downtown, right off of West Figueroa, we went in the little tiny sandwich shop. It only has a few tables, but because we were there on a weekday, it wasn't busy at all. The owner named the shop after his dog, Norton - at least that's what I remember from sitting and checking out the place. Although, I did just read on Yelp that they switched ownership in 2008. 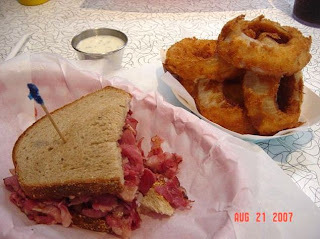 We split a traditional pastrami on rye, onion rings, and a couple of Dr. Peppers to cool us down after a long walk. The split charge for a sandwich was almost as much as another whole sandwich - OK, not that much, but I remember it was significant! The sandwich was very good - the pastrami was grilled and shaved very thin. The rings were fresh cut, and fried perfectly. The ranch dipping sauce they gave us was warm on a very hot day, so I didn't touch it. Like I said, I absolutely love a good pastrami sandwich - some of the best I've had is at Miracle Mile Deli in Arizona (had one here in Coronado, but closed down *sad face*) and Carnegie Deli in NYC. This one was pretty good, but not high up there in my list. However, I would give it another try though! Maybe a pastrami reuben this time... yum, sauerkraut. Our last meal in Santa Barbara had to be on the water, and because we stayed true to being green and find a place that's close proximity so our feet won't fall off, our choices were limited. Stearn's Wharf had the Santa Barbara Shellfish Co. (too informal), Longboard's Grill and The Harbor Restaurant (both really touristy). There was a restaurant that we noticed near Brophy's - Chuck's Steakhouse. The sign had a cool tropical feel to it. 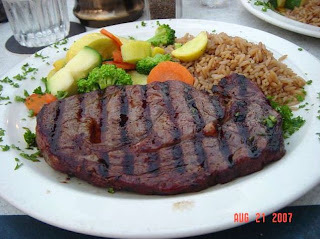 The name Chuck's sounds like a simple name for good food, especially a great steak! 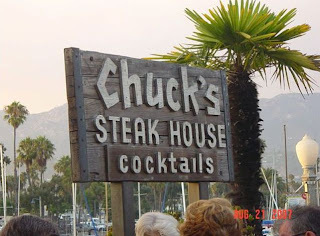 Chuck's originally opened in Waikiki, HI in 1959 and then made it's way to different US states and Guam. The atmosphere was interesting to us because the majority of the seating is outside, including the hostess stand. We were sat right away next to a huge party which consisted of older men & women - looked like an anniversary party. You can see their heads in the picture above - ha! Mike ordered the lobster bisque which tasted like tomato soup. I mean it was alright, but we expected it to taste like lobster, ya know? I ordered the Caesar salad and it tasted like a Caesar - yay for that! We both ordered the teriyaki ribeye steak, his cooked medium rare, and mine cooked medium. It was cooked perfectly and very tasty. The teriyaki rice was way to salty, and I'm glad that I had the steamed vegetables as a back up (get the potatoes!). For dessert, I had something that I knew I'd enjoy... a dish of strawberry ice cream and a vanilla pirouette (those delicious wafer things that are rolled up like cigars), and Mike had the creme brulee. An OK experience at Chuck's Waterfront Grill (front of the menu says this) or Chuck's Steakhouse. Try not to sit next to an extra large party! Overall, we had a lovely first wedding anniversary trip to Santa Barbara. It was a very quick weekend trip, but enjoyed every minute of it together - oh yeah, especially when Mike almost stepped on a homeless person sleeping in the bushes on our way back from Chuck's. Santa Barbara by far has some of the best food around. Honestly I love to vacation there because the cuisine and wine and even the hotels are all exceptional. I went wine tasting a few months ago and loved every minute of it. I've never been to Chucks but I hear it is pretty good, I'll have to check it out the next time I am in town. It's actually right by one of my favorite hotels to stay at in town so it won't be that out of the way. The Sandman Inn (www.thesandmaninn.com). Affordable and so close to just about anything!